There was one lawyer in the audience of Law x Copy, a symposium held at the Center for Architecture as part of Un/Fair Use, an exhibition on architecture and copyright law earlier this month – and she left before the Q&A. To be fair, the proceedings did run long. But perhaps she also sensed that the panel of architects, historians and preservationists, led by MIT architecture professor Ana Miljački, who co-organized the event with architect Sarah Hirschman and the American Institute for Architect’s Carlos Solis-Keyser, were less concerned with how architecture is legislated than with law as a set of conditions with the potential to shape design in practice. Law, in this case, refers to the Architectural Works Copyright Protection Act (AWCPA), an amendment to the copyright act passed by Congress in 1990 establishing the protection of works of architecture “embodied in any tangible medium of expression”, including buildings, plans and drawings. Compared with copyright for art or literature, the AWCPA is a recent development. Architecture shares certain myths with art that influence its commercial value, such as that of the singular author and singular work, but these are also relatively recent: Renaissance architects believed the peak of civilisation existed in antiquity, and so imitated ancient ruins. The commercial and social value of “new” and “novel” and even “original” are, arguably, products of modernity. Save for a few prominent examples – Zaha Hadid versus the “pirates” of Chongqing; a former Yale student versus David Childs – the case history of the AWCPA is largely uncinematic. Instead of detailing its definitions and applications, panelists approached the law almost thematically, as analogous to other types of parameters that can animate or hinder design. The consensus seemed to be that it was OK to invoke the statute a little abstractly, if doing so helped to illuminate broader questions of authenticity, authorship and influence. As Miljački pointed out in her opening address, the etymological root of “influence” is “influenza”, suggesting influence can be something that happens to you, a process of permeation, rather than a flagrant and willful act of rip-off. Like the flu, we cannot avoid influence; we can only try to modulate its manifestation. Several panelists attributed current attitudes of cynicism and self-consciousness toward referencing to the “hangover” of postmodernism – but, as Miljački argued, this denies both the historical importance of influence and its flu-like inevitability, not to mention its generative possibilities. Asked to respond to the meticulously collected archives at the Canadian Center for Architecture, Florian Idenburg, principal at New York-based studio SO-IL, described how he chose to focus on the work of Ábalos and Herreros, known for their appropriation of the work of other artists and architects in developing their own. By considering Ábalos and Herreros’s practice of assemblage at the level of method, Idenburg argued that their heavy borrowing was not plagiarism but a means through which the architects sought to enter into conversation with “the whole canon of architecture”, often in order to address the “new” landscapes made available in post-Franco Spain. Other presentations also considered the slippery issue of authorship when antecedence, originality and context are in question. What constitutes authorship when architecture almost always involves the evolution of existing typologies? How can authorship work to expose hidden value judgments or latent potential in a so-called “original”? What does it mean to preserve or destabilise “original” authorial intent? 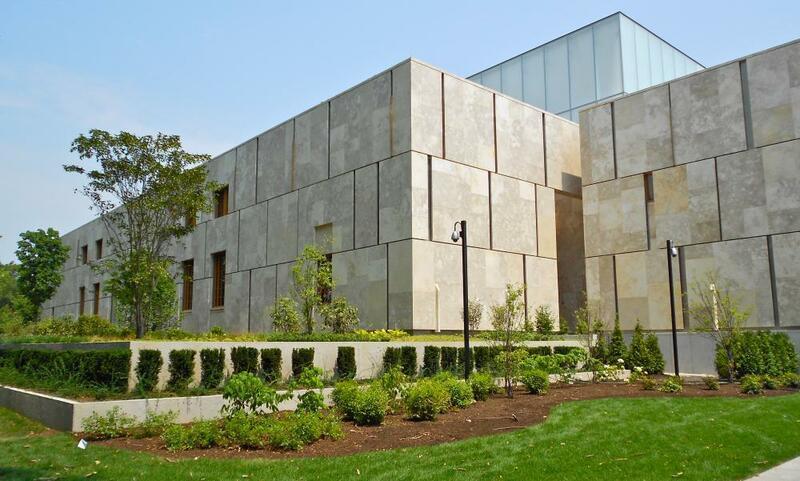 The Barnes Foundation Museum on the Ben Franklin Parkway in Philadelphia, which replicated the original building’s exhibition rooms. Speaking on Tod Williams and Billie Tsien’s controversial replication of the Barnes Foundation’s exhibition rooms, Amanda Reeser Lawrence, an assistant professor of architecture at Northeastern University, asked how sameness could be thought of not as fearful, but as ambitious. Lawrence argued that the “non-verisimilitude” of rooms paradoxically preserved the intention of the original architecture at the level of aura. Taking the original as a “starting point”, Williams and Tsien conflated the line between original and copy by foregrounding the rooms’ enduring function: to hold art and facilitate people. Architect and historian Jorge Otero-Pailos considered a few less successful but equally controversial moves made in the name of restoration, a heavily legislated field of architecture wherein preserving the old almost always involves introducing the new. He gave the products of this process the unfortunate neologism “monumentary”, to suggest that although monuments are no longer technically “original” once they’ve been augmented by preservationists, to decree a monument necessitates, in the first place, supplementation or contrast with some identifying factor. An example: staff in a public park in Spain destroyed a Neolithic tomb by removing the stones and installing a picnic table, because there was no protective supplement in place to identify the monument as such. Otero-Pailos also described the battle of two giants for architectural authorship: not architects themselves, but law and the economy. In the mid-90s, the Spanish supreme court ordered the removal of Giorgio Grassi’s addition to the Roman Theater in Sagunto on the grounds that it was too obviously divergent from the original. But the restoration attempt was ultimately left intact when the local government did not have sufficient funds to remove it. In his presentation, Keith Krumwiede, director of the Graduate School of Architecture at NJIT, indirectly introduced a third “law”, perhaps an even greater influence on design than funding or legislation: time. In a short story for his project Game of Homes, exploring the typology of the suburban generic, Keith described an all-too-familiar figure: a young architect working through the night, scrambling to meet a deadline for a home that is “new but not too new”. Charged with designing an anachronism, she splices identical portions of a Toll Brothers mansion into a single rendering until she generates “the Buckingham”, a symmetrical mess with an oddly fluid interior. Morning arrives, and the young architect presents the fruits of her hurried labour. Her boss looks at her, impressed. But he also sees a future where, the narrator assures us, the young architect has already been replaced. Time naturally challenges the sovereignty and originality of ideas, as lines of antecedence reveal themselves to be circular, even field-like patterns of influence. What once looked “original” retains its form as its surroundings change shape, cycling through retro, back to novel and returning again to “new”. This makes legislature a difficult proposition but also a rich one. During audience questions, a man in the second row raised his hand, seemingly to disagree with the basic premise of the symposium. “There is no original, and there is no copy,” he said. It’s all simultaneous. And with that, he too disappeared.